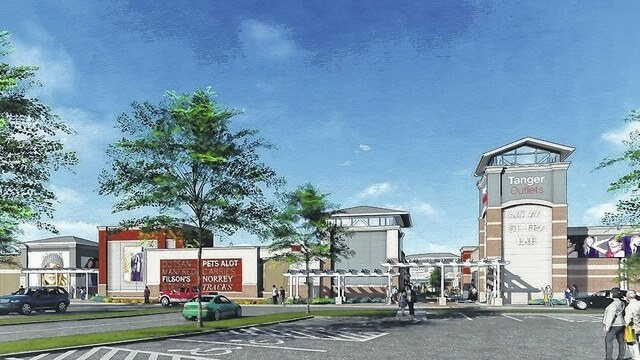 A rendering of the Berkshire Township outlet mall as shown on the website of Cleveland Construction, the company that will lead the project, set to officially begin Thursday. Lt. Gov. Mary Taylor will be among those on hand Thursday when ground is finally broken on the long-planned Berkshire Township outlet-store shopping mall. Tanger Outlets’ President and CEO Steven B. Tanger and Steven Dworkin, senior vice president of development at Simon Premium Outlets, will also be in attendance at the 10 a.m. ground-breaking ceremony for the 350,000 square-foot outlet mall that will house more than 80 upscale brand-name and designer-outlet stores at a site just off the Interstate 71 interchange at U.S. 36-Ohio 37. The ceremony will mark the culmination of more than two years of work to bring the shopping center to fruition. The development ran into several speed bumps along the the way, including two ballot measures designed to thwart progress. More than 400 construction jobs are expected to be created during construction. By 2028, when a Tax Increment Financing district expires, the development is expected to generate more than $1 million annually for the Big Walnut Local School District. Until then, however, the development will bring in just $375,000 each year for the school district. The Tax Increment Financing District – along with a New Community Authority – will help pay for $16 million worth of road improvements in time for the outlet mall’s opening. Another $16.5 million worth of improvements are planned by 2035. The outlet mall is expected to generate $19.7 million in sales tax revenue in its first 10 years of operation.